Oladeinde BH, Omoregie R, Odia I, Oladeinde OB. Prevalence of Malaria and Anemia among Pregnant Women Attending a Traditional Birth Home in Benin City, Nigeria. Oman Med J 2012 May; 27(3):232-236. Malaria during pregnancy is a major health concern and ranks among the commonest complications of pregnancy in Nigeria.5 Complications of malaria in pregnancy include hypoglycemia, acute pulmonary edema, premature labor, spontaneous abortion, still births, low birth weights and anemia.6 In the light of the numerous attendant risks of malaria in pregnancy, WHO recommended a three pronged approach to the strategic framework for malaria prevention and control during pregnancy in areas of stable transmission in Africa. This includes the use of insecticide treated bed nets (ITN), intermittent preventive treatment (IPTP) and effective case management of malaria illness and anemia.7 Reports show that compliance with this recommendation in Nigeria is poor.8 TBAs are largely uneducated,3 and may not appreciate the importance of these recommendations. Against this background and the paucity of reports on the prevalence of anemia, malaria, type and efficacy of malaria prevention methods employed by pregnant women attending Traditional Birth Centers in Edo-State, Nigeria, this study was undertaken. The study was carried out from May to August 2010, a period that coincides with the rainy season in Edo State, Nigeria. Target Institution was a leading Traditional Birth Center located in a suburban area of Evbotubu Quarters, Benin City, Nigeria. One hundred and Nineteen (119) pregnant women with age ranging from 16 - 43 years were selected for this study. Selection criteria included being registered in the center for at least one month, and non-attendance of any other conventional health facility. A detailed questionnaire was formed to assess educational status of the study population, level of awareness and use of insecticide treated bed nets (ITN), as well as other preventive measures they take against malaria. The questionnaire also sought to find out the type of anti-malaria drug (Herbal or conventional) used by them during the course of pregnancy. The data obtained were analyzed with Chi square (X2) or Fischer’s exact test as appropriate and odd ratio analysis was done using the statistical software INSTAT®. Statistical significance was set at p<0.05. Table 1: Effect of age, gravidity, educational status and malaria management method on prevalence of malaria parasitic infection in pregnant women. Table 2: Effect of age, gravidity, educational status, malaria parasitemia and malaria management method on the prevalence of anemia in pregnant women. Table 3: Effect of malaria parasite protection methods on the prevalence of malaria among pregnant women. Table 4: Effect of malaria parasite protection methods on the prevalence of anemia among pregnant women. Malaria and anemia are associated with serious mortality and morbidity among pregnant women. Despite the fact that most TBAs are uneducated, they are responsible for 60-80% of deliveries in the developing world.1 This study focused on determining the efficacy of local herbal mixtures used by TBAs in the prevention and treatment of malaria infection. The prevalence of malaria parasitemia observed in this study (78.9%), is higher than that previously reported 62.4%.17 The difference could be due to geographical location, as the study was carried out in Benin City South-South geo-political zone, while that of Idowu et al. was in Abeokuta which is in the South-West geopolitical zone of Nigeria. Agbo Iba has been reported to have prophylactic action against malaria parasite.18 However in this study; the use of Agbo Iba either solely or in combination with conventional antimalarial drugs did not show any significant difference in the prevalence of malaria. It is possible that the strain of plasmodium falciparum (the only species of plasmodia observed in this study) is resistant to Agbo Iba, as 85.2% of pregnant women who took Agbo Iba alone had malaria parasitemia. This would require further investigation to verify. The high prevalence of malaria parasitemia among pregnant subjects that took Agbo Iba and conventional anti malaria agents may also indicate resistance to either agents or possible antagonistic effect of both combinations. Again this will require further studies to verify. In a similar vein, the prevalence of malaria among pregnant women did not differ significantly within the age range of the study population. 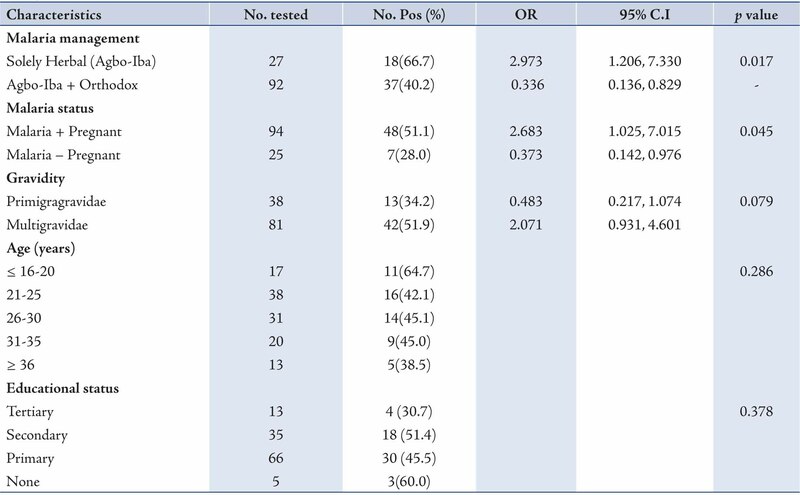 The prevalence of anemia among pregnant women attending traditional Birth Home in this study (46.2%) is lower than that previously reported in Abeokuta (81.2%).10 An important factor to consider is that the etiology of anemia is multifactorial, and thus several underlying morbid and co-morbid conditions could cause wide variations in the prevalence of anemia. Location may also account for this disparity. The use of Agbo Iba solely was significantly associated with anemia among pregnant women attending the Traditional Birth Home. Some antimalarial drugs are known to destroy red blood cells and then exert their activity against the exposed malaria parasite.25,26 This may be the same mechanism by which Agbo Iba functions; however, the Agbo Iba mixture was not effective as high prevalence of malaria was observed in this study. To our knowledge, this is the first report associating Agbo Iba with anemia. The conventional addition of blood building supplements prevention methods used by the pregnant women did not significantly affect the prevalence of malaria parasitemia and anemia. Information from questionnaire revealed that 10 (8.4%) of the 119 pregnant women had knowledge of insecticide treated bed nets, as a method of preventing malaria parasite infection, though none of the subjects had used any. The findings that none of the pregnant women had used Insecticide treated nets had previously been observed.17 There is therefore need for the Government and other intervention agencies to extend malaria control intervention programs to pregnant women attending Traditional Birth Homes with free distribution of insecticide treated bed nets. The specific duration of use of Agbo Iba with or without conventional antimalaria remedies was not noted. The malaria and anemia status of pregnant women prior to consumption of Agbo Iba and the type of conventional anti malaria used were not ascertained. These were limitations observed to the study. In brief, an overall prevalence of malaria parasitemia and anemia of 78.9% and 46.2%, respectively was observed in this study. The use of Agbo Iba did not significantly affect the prevalence of malaria parasitemia, but it was associated with anemia. Prevalence of malaria parasitemia was higher among primigravidae and least among pregnant women with tertiary level of education. Measures to control malaria infection and anemia among pregnant women attending Traditional Birth Homes are necessary. 1. Ofili AN, Okojie L. Assessment of the role of traditional birth attendants in maternal health care in Oredo Local Government Area, Edo State. Nigeria. Journal of Community Medicine and Primary Health Care 2005;17(1):55-56 . 2. Falle TY, Mullany LC, Thete N, Kharty SK, Leclerg SC, Darmstadt GL, et al. Potential role of Traditional Birth attendants in Neonatal Health care in Rural Southern Nepal. J Health Popul Nutr 2010;27(1):53-61. 3. Sadoh AE, Ogungbe RO. Multiple fractures and iatrogenic burns in a newborn due to unskilled delivery: a case report. Afr J Reprod Health 2008 Dec;12(3):197-206. 4. Nyanzi S, Manneh H, Walraven G. Traditional birth attendants in rural Gambia: beyond health to social cohesion. Afr J Reprod Health 2007 Apr;11(1):43-56. 5. Omo-Aghojai LO, Aghojo CO, Oghagbon K, Omo-Aghojai VW, Esume C. Prevention and treatment of malaria in pregnancy in Nigeria: obstetricians knowledge of guideline policy changes - a call for action. Journal of Chinese Clinical Medicine 2008;3(2):114-120. 6. Saba N, Sultana A, Mahsud I. Outcome and complication of malaria in pregnancy. Gomal Journal of Medical Sciences 2008;6(2):98-101. 7. WHO. A Strategic Framework for malaria prevention and control during pregnancy in the African region. Brazzaville, WHO 2004 AFR/MAL/04/01. 8. Wagbatsuma VA, Omoike BJ. Prevalence and prevention of malaria in pregnancy in Edo State, Nigeria. Afr J Reprod Health 2008;12(3):43-58. 9. Idowu OA, Mafiana CF, Dapo S. Anaemia in pregnancy: a survey of pregnant women in Abeokuta, Nigeria. Afr Health Sci 2005 Dec;5(4):295-299. 10. Jaleel R, Khan A. Severe anaemia and adverse pregnancy outcome. Journal of Surgery Pakistan International 2008;13(4):143-150. 11. Uneke CJ, Duhlinska DD, Igbinedion EB. Prevalence and public-health significance of HIV infection and anaemia among pregnant women attending antenatal clinics in south-eastern Nigeria. J Health Popul Nutr 2007 Sep;25(3):328-335. 12. Oshikoya KA. Anti-malaria prescription for children presenting with uncomplicated malaria in a tertiary hospital in Nigeria, after the changes of National Guidelines for malaria treatment. World Journal of Medical Sciences 2007;2(1):49-53. 13. Fatmi Z, Gulzar AZ, Kazi A. Maternal and newborn care: practices and beliefs of traditional birth attendants in Sindh, Pakistan. East Mediterr Health J 2005 Jan-Mar;11(1-2):226-234. 14. Adebayo JO, Krettli AU. Potential antimalarials from Nigerian plants: a review. J Ethnopharmacol 2011 Jan;133(2):289-302. 15. Omoregie R, Adedokun RB, Ogefere HO, Iduh P, Duru M. Comparison of the efficiency of malaria PF rapid test device, Giemsa –stained thick film and QBC in the diagnosis of malaria in Benin City. Nigeria. Mary Slessor Journal of Medicine 2007;7:1-4. 16. Dim CC, Onah HE. The prevalence of anemia among pregnant women at booking in Enugu, South Eastern Nigeria. MedGenMed 2007;9(3):11-13. 17. Idowu OA, Mafiana CF, Sotiloye D. Traditional birth home attendance and its implications for malaria control during pregnancy in Nigeria. Trans R Soc Trop Med Hyg 2008 Jul;102(7):679-684. 18. Nwabuisi C. Prophylactic effect of multi-herbal extract ‘Agbo-Iba’ on malaria induced in mice. East Afr Med J 2002 Jul;79(7):343-346. 19. Singh N, Shukla MM, Sharma VP. Epidemiology of malaria in pregnancy in central India. Bull World Health Organ 1999;77(7):567-572. 20. Tayo AO, Akinola OJ, Shittu LA, Ottun TA, Bankole MA, Akinola RA, et al. 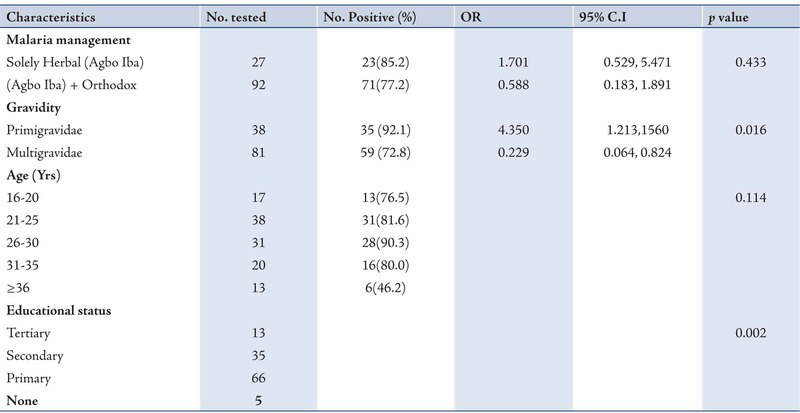 Prevalence of malaria parasitaemia in the booking antenatal (ANC) patients at the Lagos State University Teaching Hospital. Afr J Biotechnol 2009;8(15):3628-3631. 21. Fried M, Duffy PE. Adherence of Plasmodium falciparum to chondroitin sulfate A in the human placenta. Science 1996 Jun;272(5267):1502-1504. 22. Beeson JG, Rogerson SJ, Cooke BM, Reeder JC, Chai W, Lawson AM, et al. Adhesion of Plasmodium falciparum-infected erythrocytes to hyaluronic acid in placental malaria. Nat Med 2000 Jan;6(1):86-90. 23. Beck S, Mockenhaupt FP, Bienzle U, Eggelte TA, Thompson WN, Stark K. Multiplicity of Plasmodium falciparum infection in pregnancy. Am J Trop Med Hyg 2001 Nov;65(5):631-636. 24. Ouma P, van Eijk AM, Hamel MJ, Parise M, Ayisi JG, Otieno K, et al. Malaria and anaemia among pregnant women at first antenatal clinic visit in Kisumu, western Kenya. Trop Med Int Health 2007 Dec;12(12):1515-1523. 25. Crum NF, Gable P. Quinine-induced hemolytic-uremic syndrome. South Med J 2000 Jul;93(7):726-728. 26. Dhaliwal G, Cornett PA, Tierney LM Jr. Hemolytic anemia. Am Fam Physician 2004 Jun;69(11):2599-2606.